Specially selected collection to create amazing hanging basket displays. Surfinia Petunia is strong trailing variety bred to produce masses of flowers. Planted together with bright yellow Bidens for a stunning display. Spectacular combination will provide non-stop colour all summer long. Containing a bold and bright zingy mix of Bidens Gold Star alongside Surfinia Hot Pink, your hanging baskets will look spectacular this summer, with non-stop flowers from May until late October! 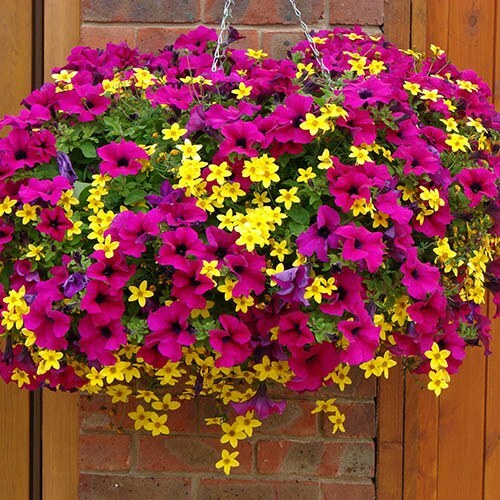 Specially selected to create amazing hanging basket displays, the Surfinia Petunia is a strong trailing variety bred to produce masses of flowers and planted together with bright yellow Bidens, you are guaranteed to produce a stunning display. This spectacular combination will provide non-stop colour all summer long. This item contains 6 plants of each variety for the ultimately sumptuous display! Supplied as a pack of mixed 12 jumbo plugs (2.5-3.5cm Diameter). Plant into pots straight away or grow on for 3-4 weeks before planting in to baskets. While this is an easy-to-maintain variety, it will still benefit fromt the occasional 'going over' to remove any spent flower heard that are persisting.